What is the process of building a new home? How do we go from architectural designs to a completed work of art? For those interested in building a new home, we've simplified the process by highlighting major construction milestones, and we take you on a visual tour of a house we're building in Seattle's Capitol Hill neighborhood. Designed by Heliotrope Architects, the front facade of the house features a prominent "floating gable." Read on to learn about the beginning stages of building a new home. The first step in building a new home is to excavate the site. Excavating, or removing soil, serves several purposes: it levels the site; allows for below grade utilities to be laid, such as mechanical, electrical, and plumbing; and prepares the ground for pouring the foundation. Above, one of the main plumbing lines, the side sewer, is installed. The concrete foundation footings of a new home. After excavating, laying subgrade utilities, and leveling the site, trenches are dug for pouring the foundation footings. Constructed of concrete and reinforced with rebar, footings support the weight of the house and prevent it from settling. If a house is a like a sculpture, the footings are like the platform on which it sits. The size and type of structure determines the depth, width, and placement of footings. In the photo above the footings have rebar protruding through the concrete, anticipating the next phase of construction, pouring the foundation walls. Foundation walls wrapped in waterproof fabric. Next, the foundation walls are poured. The foundation walls transfer the load of the house to the ground. They also act as a barrier between the wood of the house and the soil of the earth. The oldest and simplest foundation walls were constructed using large stones. In contemporary building, foundation materials have advanced dramatically, but the concept remains the same. After foundation walls have cured, the exterior walls themselves need to be waterproofed in order to prevent water from seeping through the concrete. Above, a skirt of drain board waterproof fabric is applied to the exterior foundation walls, which protects the foundation from water. The foundation walls, once exposed for waterproofing, now just peak up above the ground. All the exterior utility lines are laid and the foundation walls are constructed and waterproofed, then soil is brought in to bury the utilities and grade the site. An incredible amount of work and infrastructure becomes hidden beneath ground. 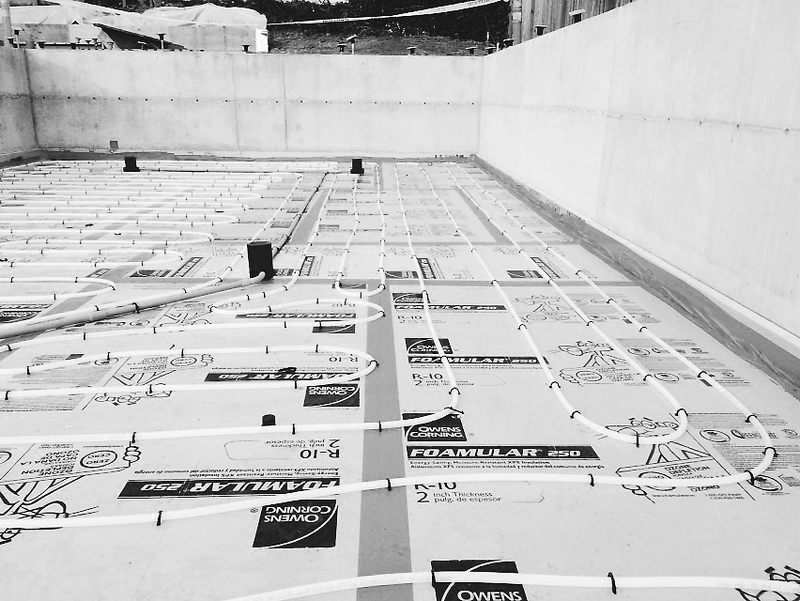 Vapor barrier, insulation, and radiant heating tubes are installed before the foundation slab is poured. This home has a hydronic system for radiant floor heating, which is highly energy efficient. Above, the tubing is installed over insulation, which prevents heat-loss toward the ground. Because concrete conducts heat well, a concrete slab is then poured on top of this hydronic tubing. Framing is the next step in the building process. Here studs and headers form walls, ceilings, windows, and doorways. Then, the frame of the house is bolted to the foundation. 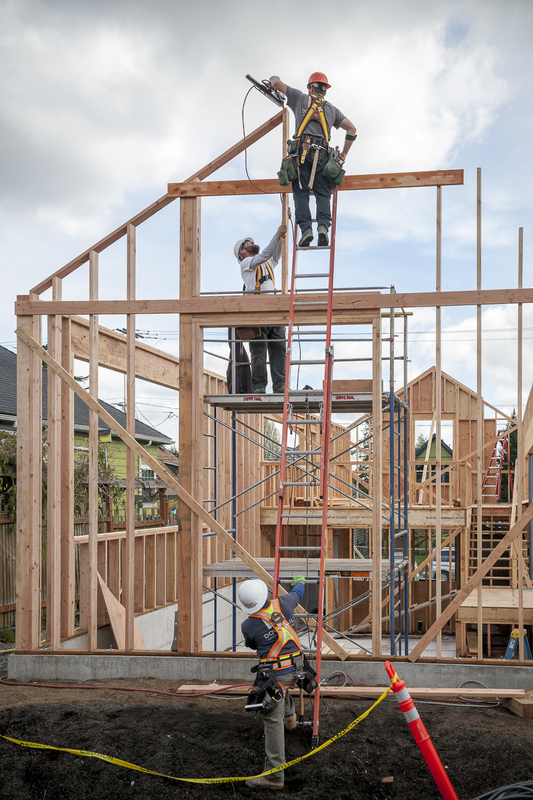 Framing provides the structure to support the form of the house, it also creates an armature for the network of electrical and plumbing utilities to come. Plywood panels attached to the framing sheathes the house. The plywood panels applied to the outer framing of the house are called sheathing. Sheathing strengthens the structure and serves as a base for exterior weatherproof siding. In the Pacific Northwest, an earthquake region, sheathing stabilizes the structure and helps prevent sheer forces from pushing and pulling the house in opposite directions. Cathedral ceiling with framed skylights. After the sheathing is applied, framing the roof begins. Above, manufactured trusses create the vaulted ceiling and the roof line simultaneously. Modified trusses are erected where skylights occur. The design of this house calls for two different kinds of roofs. On the left is a "flat roof" (actually, it has a slight slope to prevent standing water), and the right side is a pitched shingle roof. The main role of the roof is to prevent water from entering the house. The roof is also part of the "building envelope" or the physical barrier that separates a building from water, air, and heat. The Northwest is known for its wet winters and the roof is an important element in the overall waterproofing system. Waterproofing itself is a crucial and complex part of building, and the next post will focus solely on the various steps in the waterproofing process.